Now here’s something you don’t see a Surrey motorist doing everyday. 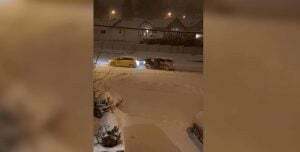 On Sunday evening, Jonnie P Daguno posted a video to Facebook that captures a taxi in Surrey being pushed up a snowy hill by a truck. What’s hard to believe is that a passenger from the truck got on the front hood and helped push the truck with their feet. The video was uploaded with the caption “😂🤣 I’ve never seen this technique before hahaha”. The 18 second video shows the cab slowly being pushed up the hill as snow continues to come down.